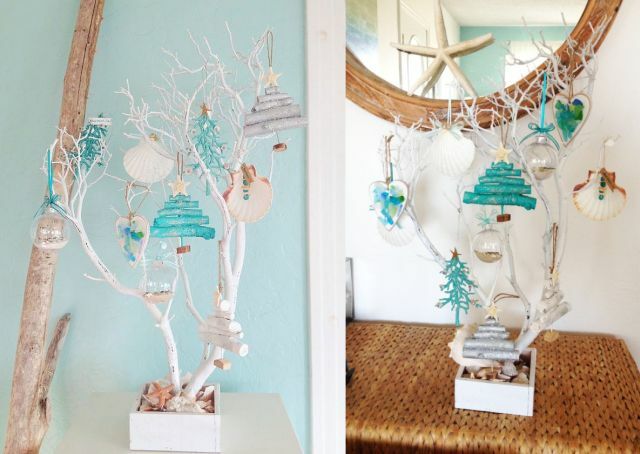 Our New Sea Branch Trees are Natural real wood Trees. Available in either painted white or Natural and with or without twinkle lights. We love them with the lights! The Holiday Trees are great for anywhere in the Home or Office and make a great Gift for those not putting up a traditional Tree. Great for all year long and after the Holidays too. Use the trees for Jewelry, Plant succulents in the bottom and add the twinkle lights for ambiance. The Trees are natural so no two are alike, but we assure you we pick out the nicest ones for our Customers. Trees measure approximately 20 -22 inches wide by 25-27 inches tall. Included Ornaments are all Hand Crafted -2 Seashell clear round Ornaments with Sand, Seashells and Seaglass, 2 Driftwood Trees, 2 Turquoise Coral and Seashell Trees, 2 White Coral and Seashell Trees, 2 White Glitter Clam Shell Ornaments, and 2 Seaglass Heart Ornaments. Flat rate shipping fees apply to this item as it is oversize. $30 for the West Coast, $42 for Midwest and $59 for the East Coast. This fee will be added to your order after it is packed. Local Customers can order online and we will call you to pick up your order. Please note if you are picking up in our Main Street store. Please Use the drop down menu to make your selections.